Hannah Graham of Bowdoin College, pictured during a game in 2018, scored 14 points on Saturday as the Polar Bears fell to Thomas More in the Division III national championship game. SALEM, Virginia — Thomas More College scored 31 points off 17 turnovers by Bowdoin College on Saturday night and used that advantage to post an 81-67 victory in the Division III women’s basketball national championship game. It was the second straight loss in the title game for the Polar Bears, who finish with a school-record 31 wins and end the year at 31-2. Thomas More completes an unbeaten season with a record of 33-0. The Saints from Crestville Hills, Ky., who led by seven points going into the fourth quarter, converted 15 of their 17 free throws in the final period to extend their advantage to as many as 19. Kaela Saner scored nine of her team-high 20 points to help Thomas More close out the victory. The Saints placed five players in double figures including 17 each from Shelby Rupp (12 rebounds, 4 assists) and Madison Temple (7 rebounds, 4 assists, 4 steals). Emily Schultz posted 14 points and Briana McNutt added 11 for the winners, who shot 46 percent from the field (26-for-56) and went 24-for-27 from the foul line. Thomas More also outrebounded the Polar Bears 39-31. 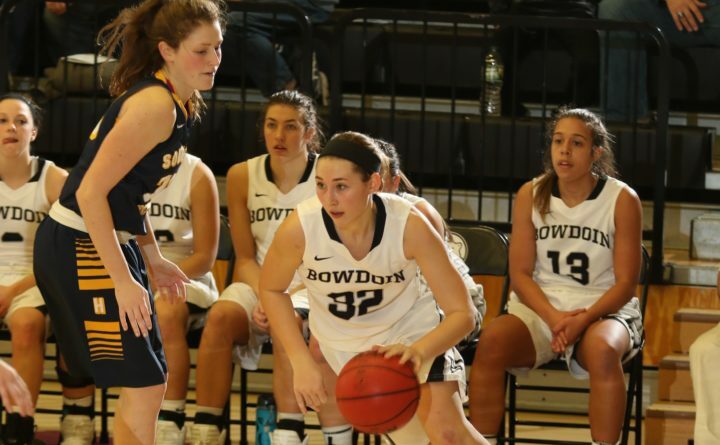 Coach Adrienne Shibles’ Bowdoin squad was paced by Abby Kelly’s 27-point, nine-rebound, six-assist, four-steal performance. Hannah Graham of Presque Isle tossed in 14 points and South Portland’s Maddie Hasson finished with 12 points and six rebounds. The Polar Bears shot 26-for-61 (43 percent), but was plagued by turnovers and the Saints’ potent transition offense. They also attempted only 12 free throws, making eight. The Polar Bears held a 19-16 first-quarter lead behind 50 percent shooting, including seven points from Graham. The Polar Bears opened the second quarter on a 6-2 surge, extending their lead to 24-18. However, Thomas More took advantage of some Bowdoin turnovers and answered with a 12-0 run, taking a 30-24 lead on a Schultz lay-in with 5:26 to go in the second period. Bowdoin stemmed the tide with a Kelly 3-pointer and trailed by just four points, 38-34, at the break. The Saints came out of the half with an 11-2 run, sparked by a 3-pointer from McNutt to push the lead to 49-36 with 6:13 to go in the third quarter. Bowdoin warmed from the field late in the frame, getting a 3-pointer from Samantha Roy and closing to within five points on a pair of Hasson free throws later in the period. A jumper at the buzzer for Thomas More pushed the lead back to seven points entering the fourth quarter and the Saints made it a 10-point game on a three-point play by Kaela Saner. Bowdoin mounted a rally to trim the deficit to eight, and had two possessions to cut into the lead further, but a layup rimmed out and a 3-pointer rattled around the rim. Temple replied with a 3-pointer for Thomas More, pushing the lead back to 67-56 with 5:49 to go. Abby Kelly was named as Bowdoin’s All-Tournament team member.